It was the final stop for us after a year of traveling the world. We were sure it wouldn’t matter where in the world our last stop would be, we’d just be anxious to get home! We most definitely would not enjoy our last stop, it would be nothing more than an obstacle; something between where we were and where we wanted to be. But then there was Quito. Situated on the eastern slopes of Volcano Pichincha, Ecuador’s capital city is a breathtaking 2800 meters above sea level. Although the altitude and thin air leaves you gasping after climbing even a flight of stairs, it does mean that despite the city lies practically on top of the equator, the temperature is a pleasant 70 F. year round. Named one of the first World Cultural Heritage Sites in 1978, this is a city not to be missed. The historical district is home to block after block of fascinating, colonial era buildings and plazas. The Basilica del Voto Nacional, the Palacio del Gobierno, and La Compania de Jesus are among the most impressive. 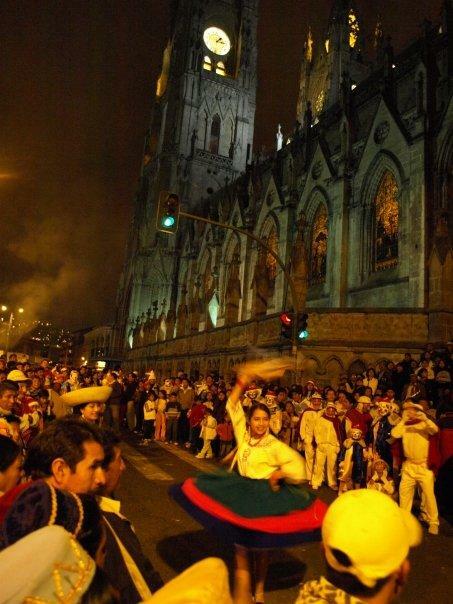 Aside from the rich colonial heritage, Quito’s other main claim to fame is its proximity to the equator. Just north of the city is La Mitad del Mundo, the Center of the World. Here you can be the consummate tourist and snap vacation pictures while straddling the equator. In addition, there are museums, exhibits and shopping to round out your trip. To get an even better view of the city, take the TeleferiQo to the top of the Pichincha Volcano, reaching new heights at 14,000 ft. Up here it gets a little chillier than down in the valley, so bring a jumper. If your lungs are up for it, you can trek to the top of the peak, another 1800 ft up. Since my daughters are horseback riders, a two day horse trek in the Andes was on our agenda. Beginning at the bottom of the Pululahua Crater, we rode up to the rim of the crater, riding through the famous cloud forest. It was a beautiful, almost mystical place. If you’re not a rider, no problem: You can visit the cloud forest on foot. But our favorite experience was not in Quito itself, but instead a two hour bus ride away in the town of Otavalo. Here you will find the largest indigenous market in all of South America. Alpaca capes, sweaters and blankets; clothing; bags; jewelry; trinkets, all at prices that will make you wish you brought an extra suitcase to bring home your wares. And, the best fish I ate over the course of an entire year. Although perhaps not world famous for its cuisine, there is marvelous food to eat in the city’s many restaurants and markets. For some serenity, spend an afternoon in Parque Carolina, a marvelous city park with a botanical garden, paddle boats to rent and food vendors to sample the local fare. Our favorite was ceviche chocho, poor man’s ceviche made with beans in lieu of fish. Quito is just a two hour flight from Miami, FL, meaning you can enjoy the city from day one with no jet lag. On the other hand, the altitude might get to you so take it easy at the beginning and save the more strenuous activities for the end of your stay. The city is inexpensive by Western standards. We rented a three bedroom, two bathroom apartment for $180 per week. Another benefit is that you won’t lose out on the exchange rate: they use American dollars in Ecuador. Public transportation is cheap and easy so no need to rent a car. They have three electric bus routes as well as regular buses plus safe, metered taxis. Most Galapagos tours either start or end at Quito and the city airport is one of the main departure points for Galapagos cruises.